Sammy Sosa became only the third player to hit 50 home runs in three different seasons Saturday, joining Babe Ruth and Mark McGwire. "I feel great to be in the same group with Babe Ruth and Mark, but the other side of this is that we lost the game," Sosa said. "I feel great for the individual accomplishment but I would have enjoyed it more if we had won the game." Sosa, who had been 1-for-22 at Busch Stadium, hit a two-run homer off St. Louis Cardinals reliever Gene Stechschulte in the sixth inning. McGwire and Ruth have hit 50 or more home runs four times each. McGwire has 32 home runs with 13 games to go but is limited to pinch hitting because he has tendinitis in his right knee. 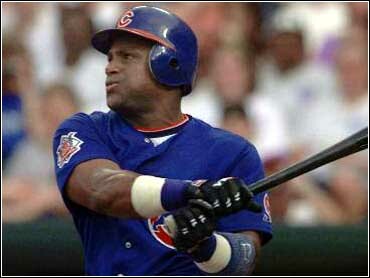 Sosa had 66 home runs in 1998 and 63 last year.